Ice excavation is a great example of a hands on - brains on learning activity; learning new words through experiencing them and participating in an activity. 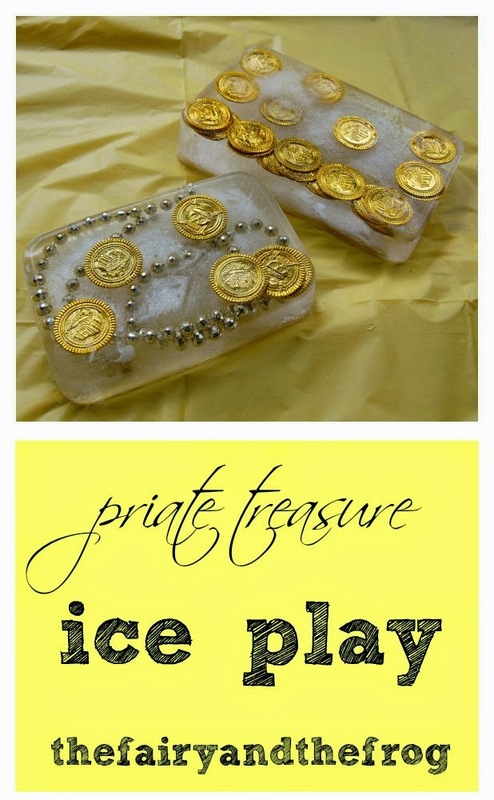 Finding hidden objects is also a great way to develop collaborative play and science knowledge with young children, Given that pirates are very popular in our house some gold coins were an obvious choice for treasure to hide in ice . 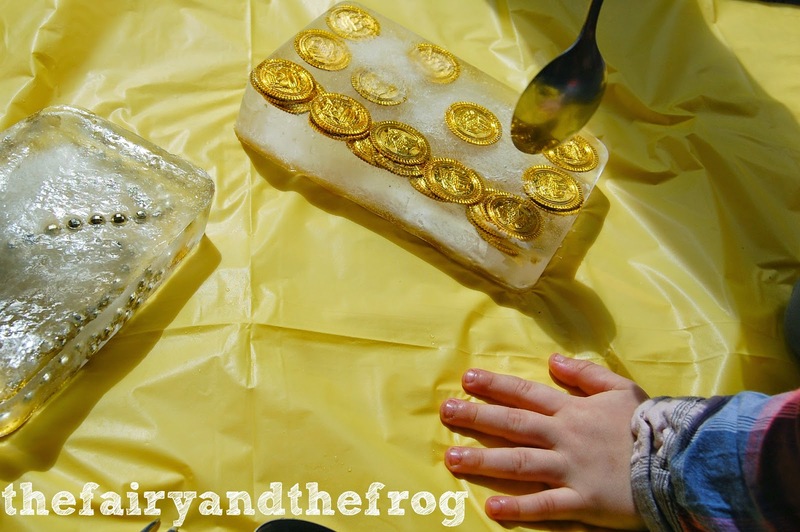 The Fairy helped me prepare some ice blocks with hidden coins after the Frog had gone to bed. In the morning we revealed the ice, talking about how the water had changed and what it felt like. The children then worked together to excavate the coins from the ice- talking about what was happening. We used spoon to bash the ice and watched it melt in the autumn sun. Using open ended questions like 'Look, what happening now? ', 'Why do you think that's happening?' 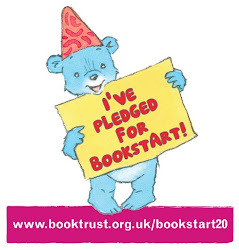 and 'What might happen next?' 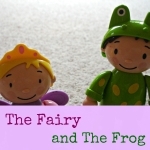 helps children to reflect on the world around them and to make observations and predictions. 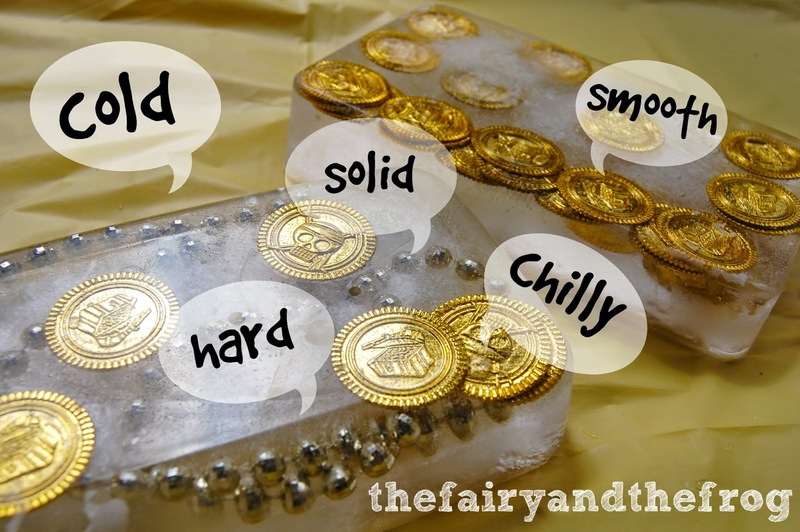 Extension idea: You could provide the children with some salt to see how that changes the melting process. As a speech and language therapist I often talk about multi-sensory teaching- children are more likely to learn and retain vocabulary if they experience it. 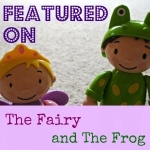 If you like this ice play you may also enjoy our posts on pretend polar ice play, ice sun catchers and ice valentines play.